The latest addition to Quickgrind’ssolid carbide tooling solutions is QPlus – a range of general purpose, off-the-shelf, 4 flute tools with a difference. At first glance, you will see that these solid carbide performance endmills are significantly longer than most off-the-shelf tools. Look closer and you may notice their special coating. Both features maximise tool life, with the coating reducing wear and the length allowing full advantage to be gained from Quickgrind’s unique remanufacturing service. 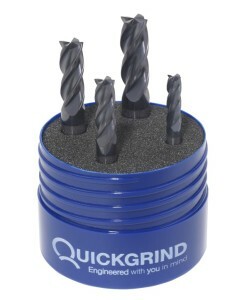 For those still unfamiliar with that process, Quickgrind technology allows tools to be remanufactured to the original quality, typically up to seven times, so customers can make savings in excess of 50% on tool costs while maintaining as-new performance. The QPlus rangedelivers the kind of results that have gained Quickgrind an international reputation for its innovation. The new tools are designed to give customers flexibility with multiple roughing and finishing applications for a wide variety of component materials.